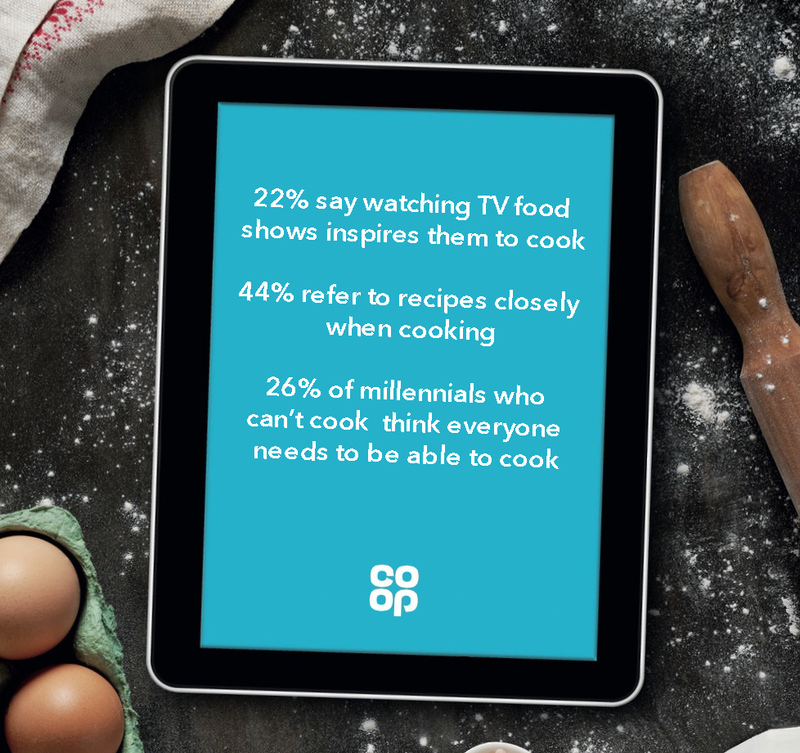 In our independent report on millennials’ cooking skills gap we look at the state of our nation’s young people in the kitchen to assess how Co-op could play a role in helping young people get cooking once again. 16-24 year olds are more likely than any other group to consider cooking as stressful. Of those not confident in the kitchen, the main reason given is that they never learnt to cook or that someone else in the household tends to cook for them. 27% of millennials have never been interested in learning to cook and 28% of those who can’t cook don’t see the importance in being able to. However, 55% of millennials still find cooking enjoyable, particularly because it offers greater control over ingredients and means cooks can share their creations with others. There has been a change in cooking behaviours for those that do already cook, with increasing numbers choosing to assembly cook by using ready-made pasta sauces and prepared salad boxes, due to their ease and convenience, rather than cooking dishes entirely from scratch. This type of assisted cooking is a reflected in the performance of the meal inspiration sector which is consistently ahead of the total food and drink market, suggesting consumers aren’t shopping for completely raw ingredients. 85% of Brits say that one of the highest factors when deciding what to cook is that it must be quick and easy to prepare. The way in which we learn has very much changed and is constantly evolving. We see younger customers going online for inspiration and in particular, those under 35 years old being more likely to use a digital device for inspiration and to follow recipes. When we learn is just as important as how we learn, with 37% of millennials who can’t already cook planning on learning when they leave home. Still, 24% don’t think they’ll ever learn and 18% feel they haven’t reached the right stage in their life to need to know how to cook yet. The first cookery demonstration video ever filmed, was filmed by Co-op in 1955 and we’ve been using film to educate and entertain since the last few years of the nineteenth century. In fact our history of education dates back to the 1850’s when co-operatives helped educate members and their children. Co-op always has, and always will continue to pioneer a vision of people helping each other whilst helping themselves, by working together for mutual benefit. In the same way that Co-op pioneered this vision in the 1850’s, SORTEDfood has resonated with vast audiences through social media today, creating one of the world’s most engaged online communities of millennials who help each other to learn about food and cooking. Both ourselves and SORTEDFood have communities at our heart, so we have partnered, to try and tackle this millennials cooking skills gap problem. Find out more about SORTEDFood here.